i recently bought a used , mint etx 125. never have used one before so i didnt know what to expect. it came with the tripod, plate and its general accs. i got it out the other day for the first time to see how it was to set up. i bought with the intentions of using in polar mode because it came with a built-in incline. due to it being very top heavy. i then began to to search for a wedge for it online and cant come up with any. do any of you know where one can be bought? i`m not very good at building/welding/ etc. although i did see some very nice homemade ones out there. but i cant see myself building something very good so it looks like i`ll have to buy one. if someone knows where i can buy one or a person who has built one before, please let me know. thats nice but i`m wanting to keep it like an sct with a wedge not a gem. You can easily build one out of wood. A couple of 3/4" plywood rectangles, one about 10" wide by 14" long, the other about 8" wide and 10" long. Use a couple of door hinges at the base of the smaller board to attach it to the larger board. Then use a length of threaded rod, a couple washers and nuts, and you have an adjustable wedge. Cheap and easy. I bought an ETX125 a few years ago, and while I loved the crisp views of the optics, the mechanicals left a LOT to be desired. In answer to your question about a wedge, AFAIK there are none. I used mine with the tilting plate on the tripod until I finally said to H*** with the factory mount. I removed the OTA, put a 2" visual back with diagonal on the OTA, and mounted it on a GEM. It was wonderful after that! Eventually I gave the OTA and mount to my grandson who still has it. Sometimes I wish I had kept it. I had one of those back in the day on the wedgepod they offered for it. It was OK but not great. Since they offered that, they didn't bother offering a discrete wedge so you'd have to build one. I don't recall a wedge but that does not mean a lot. A wedge was made here by Astro-Engineering. A wedge however tends to be costly. Reads that the 8" wedge is compatible with the ETX125, again guessing that if it is (CHECK FIRST) that you are looking at $300 and upwards. Also bit surprised the find "manualslib" as I thought it had disappeared. I have an etx125 as well and yes it seems a little unstable in polar mode. Ive on messed with it in polar a couple of times to try but since I only do visual observing not photography at the moment using it in alt/az mode is fine for easy set up and tracking and the eyepiece is always in a comfortable postion. I found in polar it is more stable with the tripod near full height with a greater spread on the legs. There is plenty of weight on the front leg, so I made up two loose dry sand filled bags with handles and wrapped them around the rear legs once setup, so to tip over it had to lift the bag. Seemed much more stable and had a vibration dampening effect. It is a cheap option because if you did find a wedge it wouldnt be cheap, this way you can test it before you jump in and spend big. 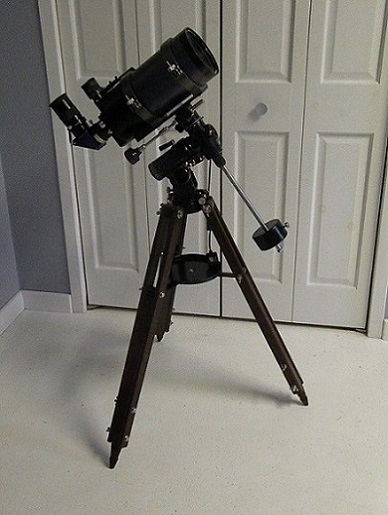 i looked at the pic of the meade wedge, i used to have one when i owned a smaller lx200 scope. but i sold it yrs ago when i bought my 12in lx gps scope. you would not happen to know what the model # of that wedge in the pic is do you? im almost positive i can get a used one for less than that. Though I don't know if they still make them. But I don't know if that one specifically matches the ETX. I would bet it can be made to work. But buying a used older one would be more economical, if you just really don't want to make one. Seriously, making one is so cheap you could fail at it and not be out more than a few $. You can likely get the scrap/cast-off from other woodworking projects at a home improvement shop. And there's a nice sense of accomplishment when you DIY. P.S. - Those wedges may have different names and descriptions, but I'd bet they are in reality the same wedge. Edited by Chuckwagon, 22 March 2019 - 05:48 PM. that was my next option anyhow. i`ll keep looking for a bit but if i dont find something, i`ll weight it down. I was in the situation with my old ETX125 and the #884 tripod. Maybe it works ok for polar mode above 50N or something like that, but down here at 40N it really does feel like a tip is imminent. I have a wooden picnic-table on my back patio. I made a simple, wooden, hinged "wedge" (maybe 8 inches square) and drilled one decent-sized hole near the middle of the base, and two correct-sized holes in the angled piece to fit the two holes in the bottom of the ETX's base. Then I mounted the whole thing near the northern edge of the table with a sturdy nut and bolt through the base hole and the table. This allows a little rotation for good polar alignment. Setting the elevation to match my latitude was a bit more painful - and finer polar alignment more painful yet. I got there in the end, but the tracking on the ETX, even in polar mode, isn't that great. I was never able to get it to track to my personal satisfaction, even like this. But man, was it rock-solid! thank you red lion for your input! i still have some time to come up with something. im kinda a fair weather observer now. ( im a lot older now) i used to go out to my observatory in 10deg temps back in the day. but not now. still way to cold & windy here in pa. for me. LOL. my BIG scope in the obs. takes a break in the winter...thats why i use my smaller ones in the winter. grab n go type a thing and right back in the warm house!!! The Meade 889 adapter sits on the standard Meade wedge and gives you exactly what you're after. Or, the Meade 884 Tripod has a build-in adjustable wedge and proper mounting bolts for an ETX mount.